The Native American story of the Kind Hawk. Learn about the culture, stories, myths and legends of American Indians and their famous chiefs and tribes. A Native American Story of the Kind Hawk to teach kids about Native Indians in a short, enjoyable, easy to read format. A long time ago, in a happy Hopi village, there lived a little boy. His mother loved him so much that she dressed him in a pretty shirt and embroidered moccasins. One day the boy wandered away from the village, over the plain, and a band of fierce Navaho Indians swooped down and bore him off. 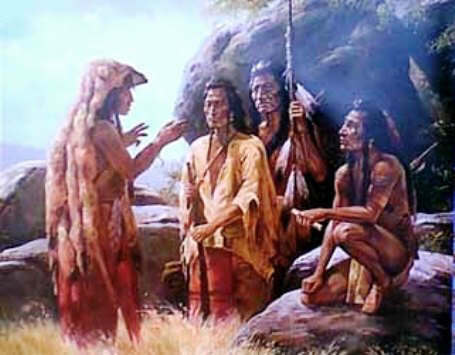 They carried him to their camp, where the squaws took his shirt and moccasins away, and gave them to the Chief's son. Then they made the boy work all day, and gave him so little to eat, that, in a few weeks, he grew thin and sick. 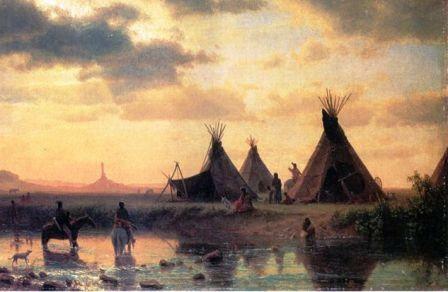 Now, near the Navaho camp was a high bluff on which lived a kind-hearted Hawk. It often flew over the camp, and saw the boy working hard, and never playing with the other children. So one day, when all the Navahos were gathered together at the Chief's lodge, the Hawk flew down and hovered over the boy's head. "Oh, do not kill me!" begged the boy. "I am not going to hurt you," answered the Hawk, "I am sorry for you. Jump on my back, and hold on to my wings, and I'll carry you away." The boy jumped on its back, and held on tight, and the bird flew up in the air. It passed over the place where the Navahos were gathered, and when they saw the boy on the back of the Hawk, they were filled with rage and wonder. The bird flew to the high bluff, and put down the boy, then it went back to the camp. It swooped down on the Chief's little son, and pulling off his embroidered shirt, carried it to the boy. Then the Hawk returned to the camp again, and taking a pair of handsome moccasins off another boy, carried them to the bluff. The Navahos were terribly frightened, and packing up their goods, left the place. The Hawk first dressed the boy, then fed him on Rabbit-meat, and other good things. After that it took him on its back and flew with him to his mother. Then, without waiting to be thanked, the bird flew away again to its bluff. The Native American Indian Story of the Kind Hawk provides an opportunity to read about the life and times of Native American Indians and many of their great chiefs and famous leaders. A Classic Short story about Kind Hawk for kids and children of all ages. This short story of the Kind Hawk is great to read to kids and children at bedtime. This very short story contains folklore about the famous people of Native Indian tribes. This short Native American story has been selected to keep the attention of kids and children of all ages. Many of the traditional stories featured in this section are true and others are folk stories or myths and legends. Read our free short story online about Kind Hawk. Read a free, online short story about the people of famous tribes Native American Indians to increase knowledge and understanding of the indigenous people of North America. The Story of the Kind Hawk. Discover the vast selection of pictures which relate to the Stories, History and Culture of Native Americans. The pictures show the clothing, War Paint, weapons and decorations of various Native Indian tribes that can be used as a really useful educational history resource for kids and children of all ages. We have included pictures and videos to accompany the main topic of this section - The Native American story of the Kind Hawk. The videos on this website enable fast access to the images, paintings and pictures together with information and many historical facts. All of the articles and pages can be accessed via the Native Indian Tribes Index - a great educational resource for kids.